We were sad to leave Casey after spending the night, we were a little bleary-eyed. A big goal for the day was to transport 3 months of frozen milk from the NICU freezer to our freezer. Our freezers are completely full so I had to send out a text request and received so many offers of people opening up their freezers. We didn't want to have to spread it out too much so we managed to make do with Scott's grandma's freezer and Bow's freezer. Thanks you guys. It took two trips that day, but we managed to clean out our NICU supply. The day went by so fast, I didn't get to take that much-needed nap. Being the responsible parents we are, we used our last night of baby-free time to wrap up some much needed chores. Scott went to a UH football game and I had a baby shower. 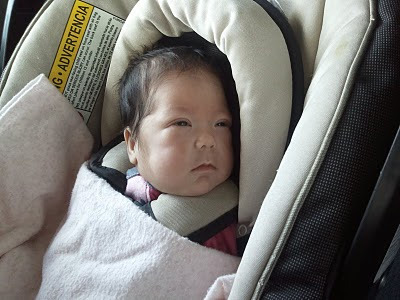 Sunday, we eagerly showed up at the NICU with a carseat and open arms, ready to take our baby girl home. We kind of expected it to take hours to take her home. We knew we would have to go through her discharge papers and meet with several staff members to go over any medicine and special instructions. We had follow-up appointments already lined up. Surprisingly, it was much less complicated than we envisioned. Speech came down to go over Casey's feeds and the plan to keep thickening her feed to help her swallowing and NOT choking. Lactation was also there to go over their plan. Casey would be on fortified formula 3 x a day and breast milk by bottle 5 x a day. We're trying to get her to breastfeed but there's so much emphasis on her gaining weight, that they want to make sure she's getting full meals so we are mostly still feeding her by bottle. Both the milk and formula have to be thickened with a thickening gel, and both have different ratios so they have to be mixed differently. She has iron added to one of her meals a day and she also has a multi-vitamin added to one of her bottles once a day. And that was it. We kept waiting for more, but that was all the instructions to go home with. So I busted out my camera and had everyone working that day who wasn't holding a baby take pictures with Casey. It was such a weird feeling to know that we were leaving for good, we were hesitating. I think we were stalling. The nurses kept peeking into the room and exclaiming "what? you guys are still here?" So, Casey's nurse Erin wheeled Casey outside and we took her home. Took her home. Can't believe we did that. [Video clip above of Casey on her birthday, July 28] You could see every little rib in her chest. Her arms were muscular and there just wan't any fat anywhere on her body. Her poor little hands and feet were so swollen, they looked like little plump gloves. She was intubated and had surfactant to help keep the air sacs in her lungs open. Casey comes home with no oxygen tank. She breathes wonderfully on her own although it will be a few years before her lungs catch up to other full-term babies. She drinks from a bottle but has to be watched and "paced" to keep her from choking and depleting herself of oxgyen. She has an umbilical hernia. It looks like she has a huge belly button "outie" but it is actually a hernia. The abdomen muscle wall is still forming and it closes from the outside of her torso inward. The hernia should disappear after a year once the wall closes, although there's a miniscule chance that surgery might be required if it doesn't resolve itself by the time she is 2 or 3. We discovered just a few days before her discharge that Casey was also coming home with a small hole in her heart. Dr. S. did a echocardiagram on her heart and discovered a small hole between the atrium chambers. It's a very common heart defect called ASD, atrial septal defect, and seems to affect girls more than boys. They assured us that it is common and doesn't often need surgery or treatment. In fact, Dr. S won't see her again until she's a year old and we'll just be under the care of our pediatrician. A lot of people don't know they had it because the defect may be so small. But it still unnerves me as it brings back everything we went through with Rory. Congenital heart defects affect 1 in 100 births. When you have a baby with a congential heart defect, you have a higher chance that your subsesequent children will also have CHDs. It's usually genetic. However, since Rory's identical twin, Allison, seemed fine, I thought in Rory's case it was just a random occurrence. There's no history of heart defects on my side of the family or Scott's. But now, with Casey's ASD, I am wondering. Maybe Allison had one but she just never got old enough for it to be detected. Casey is fine but we have to watch out for symptoms such as she gets tired or has a lack of appetite. The ride home was nerve-wracking. Kanani had offered to drive us home from the hospital so we could both sit in the back. She promised to drive 40 mph. But Casey came home on a Sunday during church, so it was just me and Scott. Scott drove and I sat in the back with Casey. I had my hand on her chest the whole time to feel her breathing. I think she was real confused during the car ride. She just stared as the car vibrated over the pavement. It was phenomenal to think that after almost 3 months, this was the first time Casey would ever be outside the hospital. Her first car. Her first car ride. Her first breath of fresh air. I had the same thought the day Allison died. I was holding Allison in a chair by the open window and I could hear the birds chirping in branches just outside the window. It depressed me to think of all the things that Allison never got to experience, that she never even got to out in the fresh air. That she would spend her entire life in that same corner in the same room. To walk out those hospital doors with Casey was a defiant victory. Video clip of Casey at a month old. And finally, Scott made a video tribute to her stay in the NICU, saying good-bye to her sisters, and coming home to stay. Thank you, thank you, God, that we got this day. YAY for Casey coming home! She's such a champ. So sassy, too, with that already-perfected stink eye! We're so happy for you guys. Wow, I can't believe how skinny she was. I remember thinking she's so fragile, but now she's tough as nails!